There are too many examples of successful persons who are blind to be content with the outdated perception that to be blind is to be hopeless. Our collective philosophy at the AIR Foundation is that, given the right tools, resources, and social support, a blind person can be an equal contributor to society, someone needed to come along and kick that door of opportunity wide open and let the World’s approximately 3 million blind children live up to their fullest potential. We began the AIR Foundation as a philanthropic means of putting accessibility into the hands of people who think they could not afford it. It never seemed right to me that blind people have to pay thousands of dollars to access the same text on a screen that sighted users take for granted. The fact that an off-the-shelf tablet can now be handled by a blind user as efficiently as a sighted user is evidence that the landscape is changing. In my time at Serotek Corporation the birth of our screen reader paved the way to online meeting systems, OCR and other sophisticated products. Unfortunately, the success of our innovation was largely limited to industrialized countries. Blind children in developing regions continue to fall behind even as technology continues to surge forward. We chose Columbia as the first pilot program site for The Tablets For Blind Children program. The emerging country has a sufficient Internet infrastructure to accommodate the ambition of our initiative. The country’s telecommunications is developing at a rapid rate, it was important to find a neutral median to launch our initial evaluations. A professional contact knew someone in the country’s Ministry of Education. The contact connected us to a key director in the country’s agency for Blind persons (INCI), who was welcoming of our initiative. 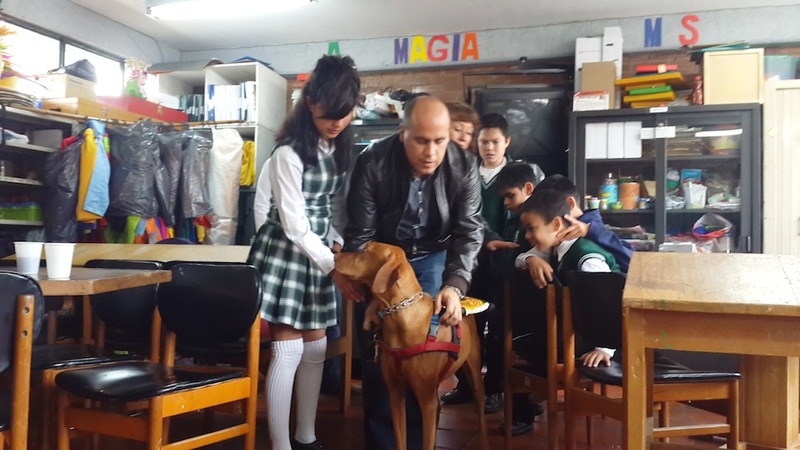 During my nine days in Bogota, I visited six schools for the blind. It was a wonderful experience to meet with and interact with students who had many questions about my iPhone, iPad, and my guide dog. Their curiosity knew no bounds, and for me the experience reaffirmed my conviction that children will surprise us with the things they can do if we give them adequate building blocks and the encouragement to chase whatever dreams their bright young minds can conceive of. I also had the privilege of meeting with various teachers of both blind and sighted students, assistive technology trainers, and a number of other government officials who expressed their support of our proposal. 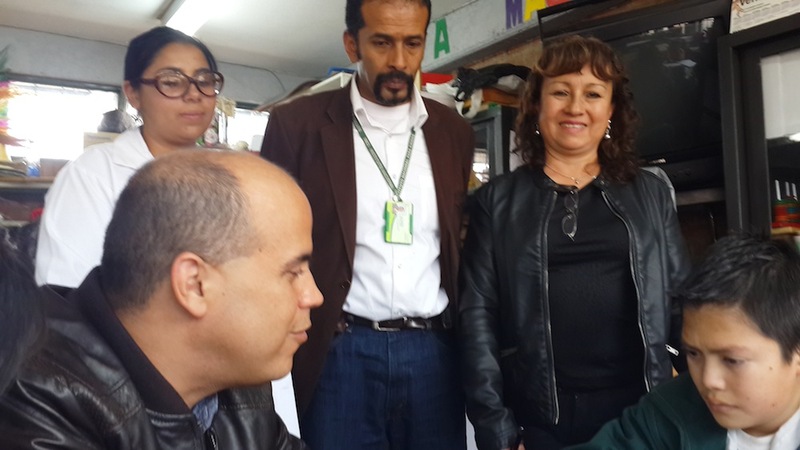 There is a growing trend in Colombia to include the nation’s community with disabilities; it is not uncommon for blind children to be enrolled in mainstream classes at an early age. Teachers are trained in using Braille and other alternative means to help children keep up with sighted peers. The general public is still not on board. There is pushback against making accommodations for the blind such as not allowing guide dogs to accompany blind persons into restaurants. The government officials I met with mentioned this to others. The local media heard about this and inadvertently gave the Air Foundation a lot of publicity. I was recognized on the street and asked about our initiative. Of course, nothing ever comes easy. Colombia is clearly on its way to making its disability community an equal part of society, but society itself needs to meet its country’s policies halfway. I raise this point to draw attention to the work that must occur outside of the classroom. It would be great if we could raise a blind child’s computer literacy, fully train them in a specific career and spin them off into instant success. Yet, blind people will need to become well versed in the practice of patient but persistent self-advocacy. No one, blind or sighted, is guaranteed employment after graduation, and prospective employers will need to reconsider old misconceptions and cultural biases that prevented them from viewing blind applicants as viable assets to long term success in an employment, educational, and even domestic settings. I am happy to report there is a rough framework in place for the pilot program. We project the program will run for a maximum of 24 months starting in January 2014 to coincide with the local academic calendar. The Colombian government will assist in identifying 100 finalists for the program ranging in age from four years old through university age. The participants will be drawn from the greater Bogota area due to geographic convenience. Students will be paired with one of three tablets. For this pilot program we will benefit from the use of iOS, Android, and Windows. The tablets will be shipped with essential apps to perform word processing, e-mail communication, contact management, and social networking. Additional apps will be provided as the needs of the participants expand. The goal is to provide each student an untarnished opportunity to work with each one of the three platforms as if they had just purchased it and to then study how each platform best suits the needs of students. Based on our findings we will then pick one or more tablets to use once the pilot is over. We have already identified two qualified trainers who can develop and execute a curriculum. The trainers will guide student participants through the initial stages of learning to navigate their devices including unpacking and independent student setup of his or her device with as little intervention from a sighted person as possible. In the beginning the use of the tablets will be limited to school space, but as the program evolves and students show their ability to be responsible with the tablet, students will be allowed to take the tablets home until such point that the tablets become a full-time personal aid. The Colombian government has provided official verification of their commitment to assist in the program. They will commit human capital and government resources in the first year, and depending on the performance in the initial stages, they will consider making a financial investment in its long-term sustainability. Click here for a snapshot of our objectives to date. Finally, I am actively working media contacts that may be able to run a report on the work of the Foundation. The coverage would raise public awareness and attract funding for our endeavor. We need you to help make the vision a reality. The passion driving the program is fervent, and the forward momentum is very real. The only way it will remain a concrete action plan is through your investment in time and donations. We’re looking for people interested in volunteering their talents in a variety of fields. Can you help translate between English and Spanish? Can you help produce marketing materials? Are you good with editing video? Perhaps you are an educator and relish the opportunity to help produce a comprehensive curriculum, or maybe you have a knack for international affairs. There is no shortage of opportunities for you to become a part of a global movement to improve the lives of blind children in developing countries while simultaneously strengthening your own skill set. I am not going to say that I have all the answers. No man is an island. But, I do have a vision and a passion for the World’s blind children. We are pioneers in this emerging global landscape and I believe that we have been empowered by our own experiences as a blind community in the developed World, to provide a hand up to tomorrow’s blind adults and hopefully once and for all eliminate the social barriers that limit the dreams and aspirations of any of our future leaders because of a disability. We could certainly use your financial support. There are a lot of great things in the works, but we need the funds to help these objectives come to fruition. We need your help in spreading the word. We need your creative ideas to help push our program to the forefront of people’s minds. It’s important to remember that helping blind children in one country ultimately boosts the potential of the blind community across the board. The general public tends to formulate opinions based on their encounters with a single member of a societal segment, and the more educated, independent, and gainfully employed individuals we can contribute to society, the more likely it will be that blind people will be fully accepted as capable contributors to the World around them. The CRPD provides a vital framework for creating legislation and policies around the world that embrace the rights and dignity of all people with disabilities. The Americans with Disabilities Act (ADA) was the model for the CRPD. On December 4, 2012 the United States Senate considered the ratification of the CRPD but fell only 5 votes short of the super-majority vote required. The U.S. Senate Committee on Foreign Relations has scheduled hearings on the CRPD on November 5th and November 12th 2013. If you're in the DC metro area, we encourage you to go to the CRPD hearings to show your support. The Senate needs to fight for the 57 million Americans with disabilities, 5.5 million disabled American veterans, and the 1 billion people with disabilities around the world. Ratification of the disability treaty is supported by hundreds of disability organizations, civil rights groups, faith organizations, veterans groups, and major business groups including the Chamber of Commerce. The treaty will not cost the federal government any additional funds. The treaty has been reviewed by both Republican and Democratic Attorneys General and by past Counsel to Presidents. They confirm that it does not threaten the sovereignty of the U.S. nor does it require any new legislation to comply with the treaty. The treaty will not harm the rights of parents with children with disabilities and would not interfere with home schooling. The treaty does not endorse abortion rights nor abortion funding around the world. This treaty is good for American business and for the world. It will allow us to bring our knowledge and our products that help make society accessible to the whole world. Failure to ratify the treaty is embarrassing for the US. We need to show the world that we support the rights for all individuals with disabilities around the globe. I know this has been a long post and if you have read this far, I know you are truly committed, as we at the AIR Foundation are, to providing Accessibility as a fundamental right for all peoples around the World. Don’t just read this and do nothing, take action and be a part of changing our global landscape by lending a hand to our efforts through your support in any of the above mentioned ways. If you have any thoughts or questions, post them in the comments or use the contact information throughout the site to reach out to me. I am looking forward to working with you in the coming years to help elevate blind children to new heights of technological independence. A single step is all we’ve taken. Yet, look at how far we’ve already come. I am excited for you joining me on this worthwhile mission. Please support the AIR Foundation with a donation via PayPal or credit card. Click here to view and print a summary of the objectives of the trip to Colombia. You may recognize my name. We have met before. If not I am a totally blind 29-year-old computer programmer from Pennsylvania. I'm not sure how I can help, but I love working with children and feel I have a responsibility to give back whenever I can. I have already given a monitary donatioon. Good luck with your work. I will be praying for you and your staff. HI Mike and others? I'm willing to help in any way I can. I'm a 36-year-old blind and with 70% Psychology major and a fan of technology! My dream is algo, especially here in mexico, to spread of benefits of using technology. For this reason, I invite you to visit my blog http://tuimagina.wordpress.com where I periodically post podcasts in Spanish regarding Jaws, Iphone and others. Since I've got emphasis on Educational Psychology, I might maybe elaborate a learning plan, and of course continue recording podcasts? My dream is to have the student aside from the technology, take home recorded tutorials for reference and reinforce what was or is learned. Looking forward to any further communication. and great initiative!